Minor gas leaks can also have major consequences. Natural gas is lighter than air, which means it normally escapes if there is a leak and will not accumulate. However, an explosive atmosphere may be created if the gas does accumulate. And this can endanger the integrity of buildings and their inhabitants. Corrosion is not the only cause of leaks. 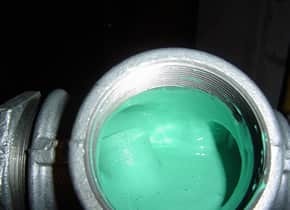 Thread connections in steel gas pipes can lose their seal over the years, even in well-maintained installations. During major gas leaks, a gas smell is often encountered because tetrahydrothiophene (odorant) is added to natural gas. This is more difficult when it comes to minor gas leaks or leaks where gas accumulates in confined spaces. But gas smells are not always encountered, which makes it difficult to assess all situations. Thanks to its very accurate and precisely calibrated measuring equipment, Cibor is able to determine if there is a leak and how big it is . 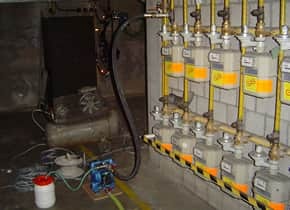 We can then use a unique inert tracer to locate the exact source of the leak. Besides dealing with leaks, we are also performing more and more preventive measurements (particularly in apartment buildings). This gives residents peace of mind and allows faults to be identified before real problems arise. Would you like to know more about the detecting leaks in your gas pipes? Then discuss your needs with one of our experts on 014 570 310 or send us an email.